Different generation of line cards, can hold different number of prefixes, MAC addresses, bridge domains. By default trident line cards have 512K ipv4 prefixes, but can be expended to 1.3M. See table below. Based on https://tools.cisco.com/bugsearch/bug/CSCul97045, 5.1.1 version might have trident scale changed by default to support 1M routes. 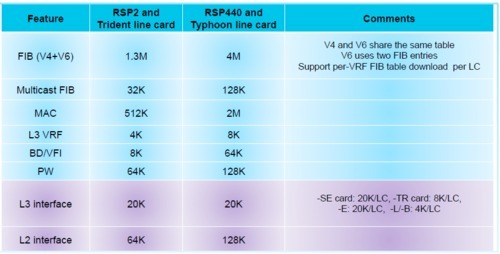 Typhoon line cards have different processors for L2 and L3. The hardware profiles scale doesn't apply to Typhoon line cards. Changes the hardware scale profile. 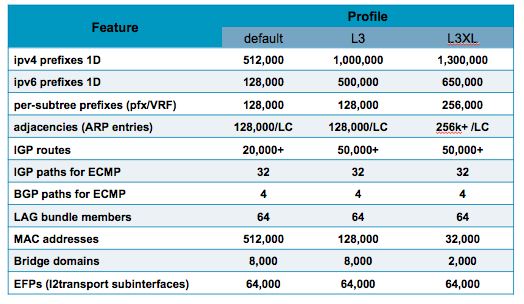 Shows the utilization of ipv4/ipv6 prefixes and how much more is available.